My 580 is the folder I use to complement my fixed blade while in uniform. The axis-assist really in an excellent mechanism, with the small caveat that is nigh on inpossible to close one-handed without using you leg or something like that. Not so much a problem while doing the things you do in uniform but this is in no way a gentlemans folder or indeed something I would even consider for EDC. The best thing about the axis assist sompared to for example the Kershaw SpeedSafe-knives is that the axis assist will apply spring pressure on the blade until it is in the fullt extended position, something most other assisted mechanisms will not. Nu, the (minor) problem I have with the 580 was the wonky handle. I never understood why they couldn’t just offer a 551-assisted, the handle of the later is much better than that of the orinary 580 (which is still good, mind). When I see this beuty I can sort of understand why. Very pretty and an excellent choice for the collector but I don’t think I’d spend my coin on one. As always Dan, a great review. Thanks for considering those of us in colder climates as well :). Hey Lew! Yeah the assist isn’t the most practical for EDC. However I found it carried well, so I really didn’t mind it, and yeah I usually ended up closing it by using my leg. Good point about the spring pressure being applied all the way through, it’s a really robust spring and I love the way it shoots the knife out. My pleasure as always Lew, thanks so much for dropping by! I would also say that the blade shape of the 580 is slightly different, the blade on the 581 is more like that of the 585. Your is much prettier than that on the 580 and will no doubt be a much better slicer, that on the 580 with it’s bayonet-shape is hopefully slightly better at stabbing fools in the ear until they are dead. Tip should be stronger on the 580 s’well. I noticed the blade shape was a little different from the 581 and I think both will work pretty well but I totally agree that the 580 appears to geared more for combat! I hear ya man – they would both get the job done. I look forward to reading the article. I like the strong design; and, yes, it’s pretty. Even so, I don’t like that the studs can jam, unless they are pressured just so. As for the assist spring, blade is so slow that I would prefer a full auto, or don’t bother with it; I don’t lke the resistance that precedes the spring (at all). Too heavy for pocket carry, and too slow as a tactical; still, an excellent woods knife. this was my first “expensive” knife in my collection. I really like the aesthetics of this knife. It is a beauty (to me anyhow). I don’t use it much (don’t want to damage it through use), but every once in a while I take it out of the pouch it came with and mess around with it for a few minutes (as I do with my other knives). Another excellent knife review. I picked up a 585 Mini Barrage about a month ago and just love it. I am just getting started in the hobby of knife collecting and very much enjoy purchasing and carrying USA made products. Benchmade is my favorite brand at the moment and have my eye on the Presidio and Sequal models. Keep up the good work and best regards. Hey Mike! Thanks so much man! I am right there with ya on the USA made products, which is part of the reason why I like Benchmade so much. The Sequal and Presidio are both awesome folders, I’d love to get my hands on them as well! And I am glad to hear you are enjoying your 585, these Barrages are so well done. Thanks again for stopping by and leaving the very nice comment. I appreciate the support my friend. Take care. I really like your review. I have been a Benchmade fun for a while and you have hit the key points. Comparing to Barrage 583 SBK (Black American Tanto of 580) I wish they offer Tanto style in 581/586 series, perhaps 584? I still feel comfortable to close one handed. Ambidextrous to close given that I change the clip that supports my ring and pinky finger. I feel their thumb jimping is a bit harsh, may be because of Aluminum bolster. ALso thumb stud feels a bit sharp on my model. Thanks for dropping by and commenting, man. I greatly appreciate it. Glad you like your Barrage. A tanto version would be interesting. I have carried many knives during my 30+ years of law enforcement, but Benchmade is by far the only knife you need to carry. 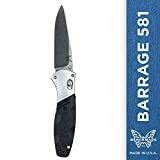 I recently added a Barrage 581 to my collection and agree that it is both a “gentlemen’s tactical knife” and just a “good all around knife” for any situation. You can not go wrong with this one! Glad you like yours too. I agree, can’t go wrong with this one. Great review. I personally love barrage 581 but i lost it during shifting to new apartment. Next time please also review some traditional folding pocket knives as i am a big fan of those. Hi Matthew, Thanks for taking the time out to comment. Sorry to hear you lost your Barrage. Ouch. We have a small but growing collection of traditional knife reviews. You can find them all here. Thank you Dan. Appreciate your response.